Here's your chance to have lunch with Eddy Cue at the stunning new 175-acre Apple Headquarters in Cupertino, CA, where you will learn more about Apple's industry-leading content stores and online services. This is a rare opportunity to see “Apple Park” and engage in a one-on-one, in-depth conversation with one of the most innovative business minds of our generation. The auction has an estimated value of $50,000. Bids can be placed between now and June 28 at 12:00 p.m. Pacific Time, in support of the National Association of Basketball Coaches Foundation in Kansas City, Missouri. The National Association of Basketball Coaches Foundation is a non-profit organization that aims to bring attention to the positive aspects of the sport of basketball and the role coaches play in the academic and athletic lives of today's student-athletes. 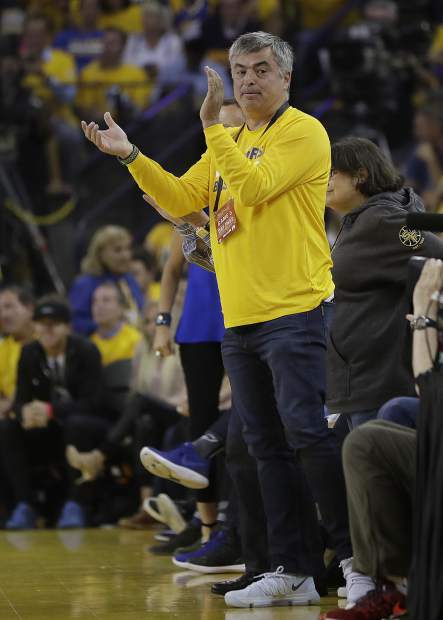 Cue is a longtime basketball and Golden State Warriors fan. The private meet and greet will be scheduled at a mutually agreed upon date by June 30, 2018. The winning bidder must be at least 18 or older. The cost of the meal and gratuity is included, but travel and accommodations are not. The experience cannot be resold, re-auctioned, or transferred. I would pay to not have lunch with him. LOL! I wouldn't have lunch with this moron if he paid me! Whoever wins, convince him to leave Apple. I want a Craig Federighi charity. He could give me hair styling tips. I Typically don't like to set a preconceived notion with someone if I have never had a personal interaction with them. But something about Eddy Cue is bothersome. I think it's the way he conducts himself onstage and offstage. He just carries a sense of arrogance more than any other Apple executive and he just appears to have an attitude. I know he has been around with Apple since Jobs era, but I just don't have an appreciation for his candor. Yep. I'm a shameless Apple fan but something about his attitude rubs me the wrong way. I hate to say it but he has a real slimy, snake-oil salesman way of carrying himself. It's personally bothersome because I don't like to be judgemental, especially if I don't know the person. However I've seen a lot of pro-Apple fans (yourself included) who have been saying the same thing. So it's a little reassuring that I'm not alone. Maybe there is something off about him. I could watch Craig give a keynote all damn day. Definitely has the best personalty(at least, on stage and in interviews) of all of Apple's execs. Strange world. I'd feel weird about eating with someone that paid more than 50000 dollars to have lunch with me.